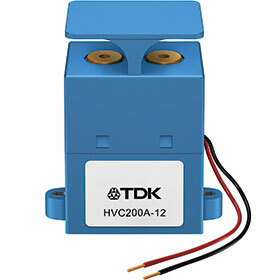 The new HVC200A from TDK is a bipolar, high-voltage contactor for the switching of high DC voltages and currents. It is designed for operating voltages of up to 450 V d.c. and a high continuous current of 200 A. Arcs that occur when disconnecting the DC load are quickly and safely extinguished with a gas in the hermetically sealed switching chamber. The HVC200A, with its dimensions of 89 x 44 x 93,5 mm (l x w x h), is available in drive versions for 12 V (B88269X1000C*) or 24 V (B88269X1010C*). Both versions have a power of 6 W at the rated voltage. As an option, the contactors can be equipped with a circuit for detecting the switching status. High-voltage contactors with a high continuous current capability are used, for example, in e-mobility applications for the fast disconnection of the battery from the drive, as well as in DC charging stations. Further applications include photovoltaic systems and uninterruptible power supplies (UPS). Versions with 12 V and 24 V drives for continuous currents of between 100 A and 500 A at maximum permissible operating voltages of 900 V are currently in development.